Fulham make the trip to Pride Park this weekend, to play a Derby County side currently occupying another one of the playoff spots. The Rams haven’t been on great form of late, but there’s plenty of talent in their side and the Whites hate playing Gary Rowett teams. Our man George Singer goes a bit deeper. Fulhamish Tip: Tom Cairney to score anytime is 18/5 with Grosvenor Casino. Hello and welcome to another edition of Before the Whistle! 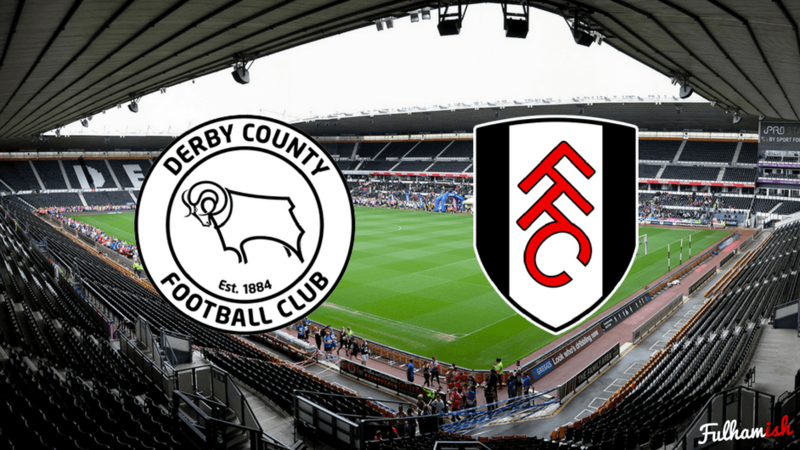 Today I take a look at our upcoming trip up to Pride Park to face Derby County. In a promotion crunch match, against a side struggling for form, what do we need to do to bring home the 3 points? The last time the 2 sides met was back in November at the Cottage. The match ended in 1-1 draw, the last of a 5-match winless streak for the Whites. This kept us pegged down in 17th position – how things have changed! Olly Norwood opened the scoring on the night, surprising Scott Carson with a freekick that went right over his head. Vydra replied quickly after half time, deftly finishing after some terrific buildup play from Tom Lawrence. Fulham arguably looked best placed to win the game, however plenty of their second half chances were wasted. The Rams held on, and happily travelled home with a precious point. In their previous game, a 3-3 draw at Reading, Derby used their tried & tested 4-2-3-1 system. They’ve used it all throughout the season, rarely rotating players, so we’re likely to see something very similar to the above on Saturday. There will however be a forced change at right back, as Bairdinho starts a ban for a straight red given last weekend. However, the major talking point will be whether top scorer Vydra will return after missing the Reading game. It feels like a 50/50 call for Rowett – however I’d fully expect it’s a risk he’d want to take in such a crucial game. If you take a look at the league table, and look at Derby’s goals conceded, you’d assume that they have one of the best defences in the league. However, the above graphic shows that compared to the expected goals model, they’re conceding a far fewer than they should. Expected goals is normally a good long term indicator of how a team is going to perform. Whilst many have called out Derby’s poor form recently, to me it’s an indicator that Derby are now starting to concede as many as they should. They’re also likely to continue to do so, so I wouldn’t be surprised if they start to slowly fall down the table. Teams lately have found value in running straight at Derby’s centre backs. Whilst Keogh and Davies are both experienced players, they’re now slightly past their prime and aren’t blessed for pace. Especially as they’re supported by Joe Ledley and Tom Huddlestone, there’s an opportunity to use fast attackers in the centre of the pitch to run directly at their slow defence. To me, there’s only one man to choose here (assuming he does play! ), their Czech star Matej Vydra. The Rams forward has been grabbing all the headlines with his goal return, and is surely having the season of his life. Whilst these numbers are given a healthy boost by Vydra taking penalties, even discounting these he’s one of the best marksmen in the league – having the 6th best ‘goal per 90 mins’ ratio. Derby like to make most of their 3 attacking midfielders in attack. Often a trio of Weimann, Lawrence and Vydra will play – who all have similar strengths: pace and trickery on the ball. A common Derby tactic is to play through balls past the opposition defense, for one of these 3 to run onto. It’s not uncommon to see long balls pumped forward from centre backs, or well weighted throughballs from central midfield, past opposition fullbacks. The Derby midfielder will then cut inside, and pass to a man in the middle to finish. More often than not, the finisher this season has been Matej Vydra. He’s running high on confidence, and doesn’t need a second chance to put his chances away. In attack – we should look to pass the ball around quickly to isolate and move past the opposition centrebacks. If we can get behind the fullbacks, and directly attack the ageing centre back pair, we should be able to cause danger in the box. Whilst there is absolutely no need to drop Mitrovic, it feels to me like this is the kind of game where Kamara in the second half may give us a useful weapon. In defence – we will need another assured performance from Kalas & Ream to cut out the inevitable through balls. Protecting against these will be all about defensive positioning – something which the pair have recently excelled in. I’d also recommend that KMac tracks Vydra’s runs, and perhaps man-marks him to cut off the chances of him getting on the end of cut-backs. Whilst it wasn’t long ago that Derby looked nailed on for second place, this feels like another match where can be confident of getting a good result. Let’s hope our magnificent unbeaten run continues, and get the win that catapults us up to 4th! COYW!! Hopeful Fulham fan with a big love for football stats. © 2019 Fulhamish. All Rights Reserved.